Sodium metabisulfite market to derive commendable proceeds via pulp and paper sector over 2019-2025, Asia Pacific to stand tall as the most lucrative terrain for industry expansion « Global Market Insights, Inc.
Endowed with an extensive end-user spectrum including food & beverages, pulp & paper, leather, and textile, sodium metabisulfite market is fast emerging as one of the most promising investment avenue in the recent years. The approval by government and regulatory authorities such as European Union and U.S. Food and Drug Administration (FDA) has further strengthened the legality of sodium metabisulfite and has helped the product manufacturers in reaching out to new business verticals. With the rise in digital media and increased usage of Internet, the worldwide pulp and paper sector has been focusing on reshaping manufacturing strategies and new business models to fulfill the changing demand patterns. Personalized packaging and cardboard products have now emerged as the most lucrative commodities of the overall pulp and paper sector owing to the overwhelming demand from the burgeoning e-commerce industry. Moreover, high levels of production uniformity and the automation of manual processes has transformed the economic landscape of the pulp and paper sector as lower energy and cost-efficient production has largely become attainable. Apparently, it would be prudent to mention that it is this sector which is slated to apportion about 45 percent remuneration share of the global sodium metabisulfite market in the year 2025. A host of impressive characteristics such as easy accessibility, cost-effective, and high-level of safety has led the major pulp and paper industry players to increase the uptake of sodium metabisulfite as a raw material in the last few years. With the presence of a large number of suppliers and manufacturers of the chemical, the sodium metabisulfite market has gained tremendous momentum in the APAC region. The swift expansion of numerous end-user sectors such as leather and textile industries in across the region has been a pivotal factor in propelling the product demand as it is utilized as an auxiliary in bleaching and decalcification processes. Elaborating further on the impact of the leather industry on the sodium metabisulfite market share, the overall leather industry in India has transformed itself from a mere raw material provider to a major product exporter, with total good exports standing at USD 3.05 billion during April to October 2018. Needless to mention, these numbers are a testament to the fact that developing countries like India, South Korea, Thailand, and China would emerge as the prominent import destinations of sodium metabisulfite in the upcoming timeframe. In fact, as per a research study published by Global Market Insights, Inc., the APAC region is slated to apportion more than 45 percent of the total revenue share of the sodium metabisulfite market in the year 2025. Although the growth prospects of sodium metabisulfite industry appear highly-promising, it would be quite imperative to take note of crucial challenges that may hinder the rapid product penetration across various geographies in the upcoming times. The first set of challenges are various health issues directly associated with sodium metabisulfite which can cause grave health hazards such as dysfunctional gastrointestinal system, skin allergic reactions, and other chronic ailments. Apart from these diseases, the increasing availability of alternative products along the likes of L-cysteine, citric acid, benzoic acid, sorbic acid, and sodium bisulfite as a preservative is bound to adversely impact the commercialization potential of sodium metabisulfite industry in the years to come. 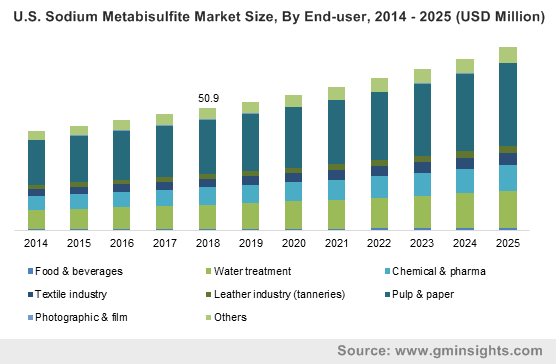 However, the growing number of industry players (especially startups), technological advancements, expansion of different end-user sectors, easy accessibility to premium raw material, and economic growth being witnessed across APAC region is certain to fuel the growth prospects of sodium metabisulfite market, which is slated to exceed USD 496 million by 2025. This entry was posted in Bulk & Specialty Chemicals and tagged Chemical & Pharma, Food & Beverages, Food Grade, Global Sodium Metabisulfite Market, Industrial Grade, Leather Industry, Photo Grade, Photographic & Film, Pulp & Paper, Sodium Metabisulfite Market, Sodium Metabisulfite Market Forecast, Sodium Metabisulfite Market Growth, Sodium Metabisulfite Market Report, Sodium Metabisulfite Market Share, Sodium Metabisulfite Market Size, Sodium Metabisulfite Market Trends, Tanneries, Technical Grade, Textile Industry, water treatment.